Many people will close their eyes to calories over the holiday season with parties from Halloween to New Year’s and indulge in buttery, creamy, and decadent desserts. However, not everyone has the time or desire to make them. Well, do I have the dessert for you! Trust me on this one; and I am fussy about desserts, especially those that are not homemade either from my own kitchen or that of a trusted family member or friend. A dessert ordered online (gasp!) had better be pretty darn good for me to recommend it. 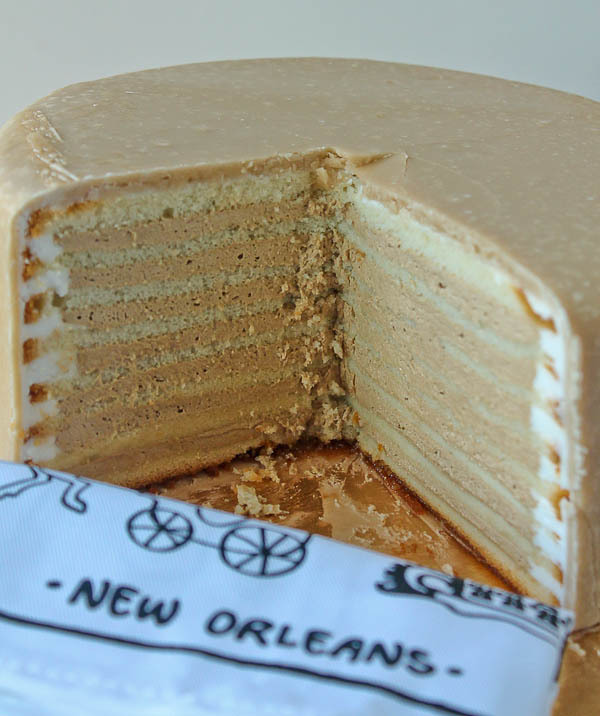 This is a “Doberge Cake,” (pronounced DOUGH-bash) which is THE birthday cake of New Orleans. The first time I ever tasted a Doberge cake was not for a birthday party, but at my daughter Kara’s wedding in New Orleans. 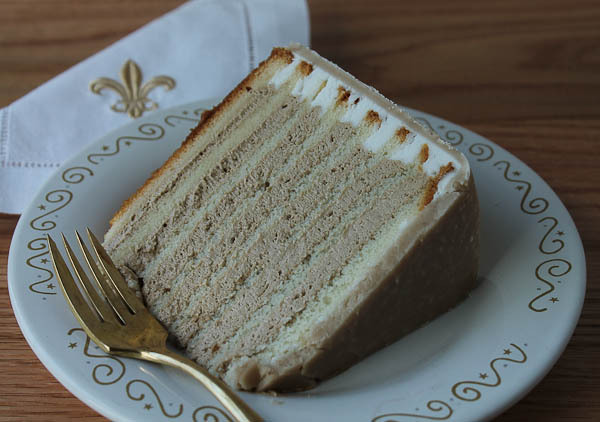 It was like this one, which is the salted caramel flavor, but on a larger scale, and hands down, the best wedding cake I have ever tasted. Ever. You must visit the website just to read the flavor offerings! 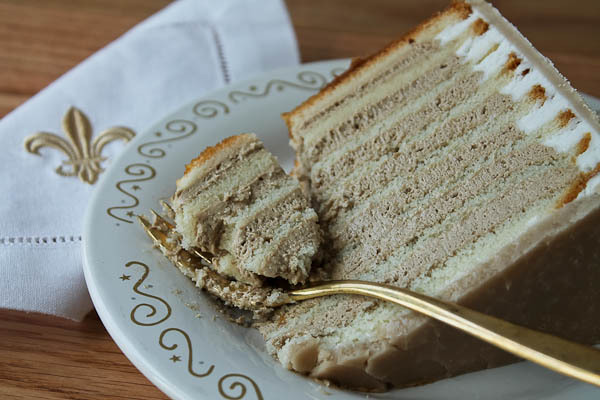 There are many classic favorites such as chocolate, lemon, strawberry, red velvet, butterscotch, and banana; but how about a “Velvet Elvis” which is white cake layers, with peanut butter banana pudding layers, and a peanut butter bacon poured fondant! 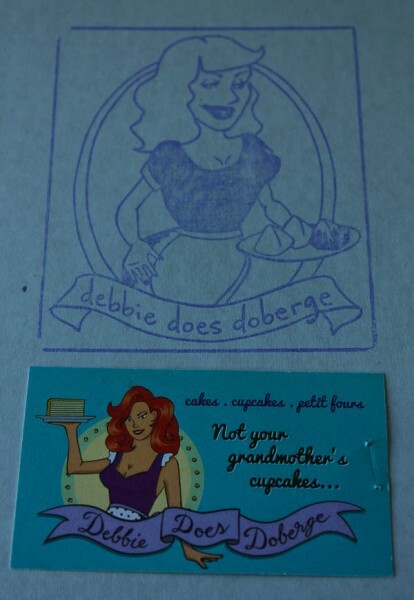 There is a blueberry pancake with white cake layers, blueberry pudding layers, and a maple poured fondant. Others include Whoopie Pie, Root Beer Float, Peanut Butter Cup, Praline, Fig-White Chocolate Goat Cheese, and I-Used-To-Be Thin Mint. So far, I have only tasted the salted caramel flavor, but my next choice would be the blackberry. My daughter Kara had the cake shipped to us over the weekend and she had one ready to celebrate the birthday this week of her beloved father-in-law. We all celebrated the birthday together in spirit even though we are far apart at the moment. It was a special cake for a special, wonderful man, and also reminded us all of the joining of our families at the wedding where we enjoyed our first taste of a Doberge cake. 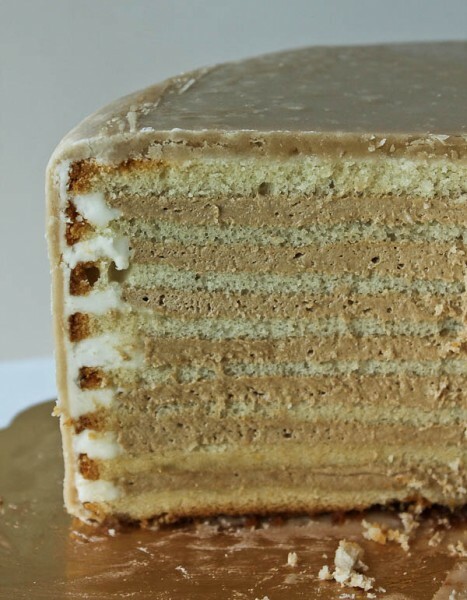 The cake is delivered frozen and comes in various sizes, and of course dozens of flavors. However, only the 8-inch size can be shipped nationally, but it is enough to feed a crowd; or what the heck, order several in different flavors. You won’t be sorry. All other sizes, along with the cupcakes and petit fours are available only locally. After our cake was delivered, I immediately placed it in the refrigerator to thaw and it was ready in about 24 hours. Make your parties stress free and order a cake for the holidays. Or two. Or three. Your guests will ask for seconds, but be sure to hide a couple pieces for yourself in the freezer for later.